VEB Porzellanmanufactur Plaue (Plaue, Germany, established 1816). “Singing Pig” Stein, ca. 1900. Glazed hard paste porcelain, colored underglaze decoration, and pewter. Milwaukee Art Museum, Gift of the René von Schleinitz Foundation M1962.984. Photo by Melissa Hartly Omholt. Ready for some laughs? In this post, we’ll be looking at German steins meant to be amusing. The industrial revolution of the nineteenth century meant that more goods could be produced quickly and more people could afford those goods. Developments in the technique for shaping ceramics meant that steins didn’t have to be a standard shape—they could be molded in all sorts of ways. And, in a never-ending quest for novelty, they were! Enter the character stein. At first glance, character steins do not even look like drinking vessels. They look more like a figurine. The body and lid create a sculptural whole, with the lid an integral part of the figures. The subject matter ranges widely. There are animals, such as singing pigs (see above left) and frogs. There are historical figures, such as Friedrich Ludwig Jahn, the founder of the Turners, the German gymnastics association, or Otto von Bismarck, first chancellor of the German Empire. Other types include clowns, nuns, and elves (like the one below). German. “Elf” Stein, ca. 1900. Earthenware with colored slip and glaze decoration, and pewter. Milwaukee Art Museum, Bequest of Dorothy Trommel in memory of her parents, Eunice and Howard Wertenberg M2013.44. Photo by John R. Glembin. There are even vegetables. Radishes were very popular, shown either happy or sad. This may seem odd, until you learn that salted thinly sliced radishes were a common beer hall snack. And then there is the skull. Why in the world would someone want a stein shaped like a skull? Ernst Bohne Söhne, Rudolstadt (Thuringia, Germany, 1854–ca. 1920). “Skull” Stein, ca. 1900. Glazed hard paste porcelain, colored underglaze decoration, and pewter. Milwaukee Art Museum, Gift of the René von Schleinitz Foundation M1962.948. Photo by John R. Glembin. 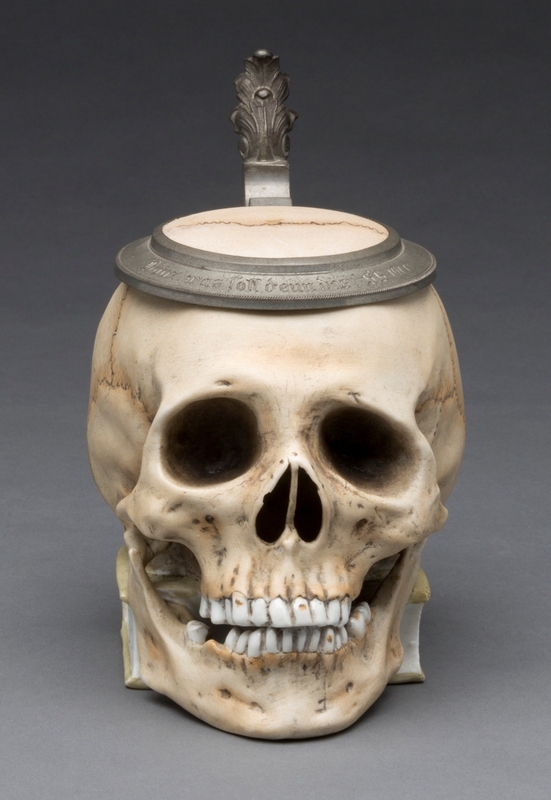 Well, since some steins were geared for certain occupations—such as the railroad stein covered in a previous blog post—a skull stein could appeal to a doctor. 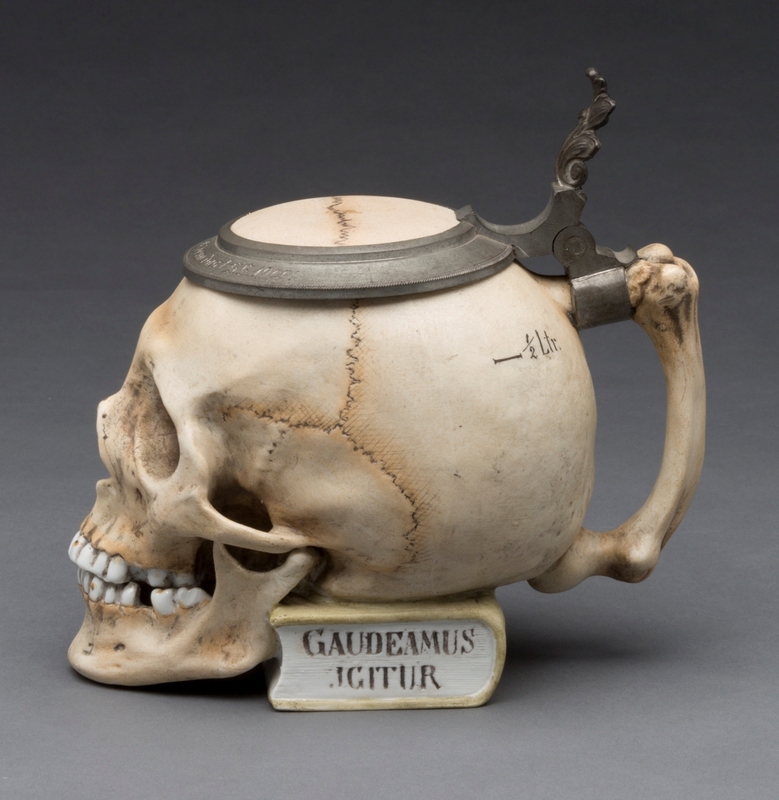 However, skulls were often given as gifts to college graduates in all fields. Evidence for this can been seen in our skull stein, which shows the skull resting on a book. One side reads Gaudeamus Igitur; the other says, Juvenes dum sumus. This is Latin for “so let us rejoice while we are young,” the beginning of De Brevitate Vitae, or On the Shortness of Life, a popular hymn sung at university graduation ceremonies in Europe. It seems an appropriate joke, then, to give a graduate a drinking vessel in the form of a skull. It will encourage the recipient to enjoy life now, and literally follow the motto “eat, drink, and be merry, for tomorrow we die”! 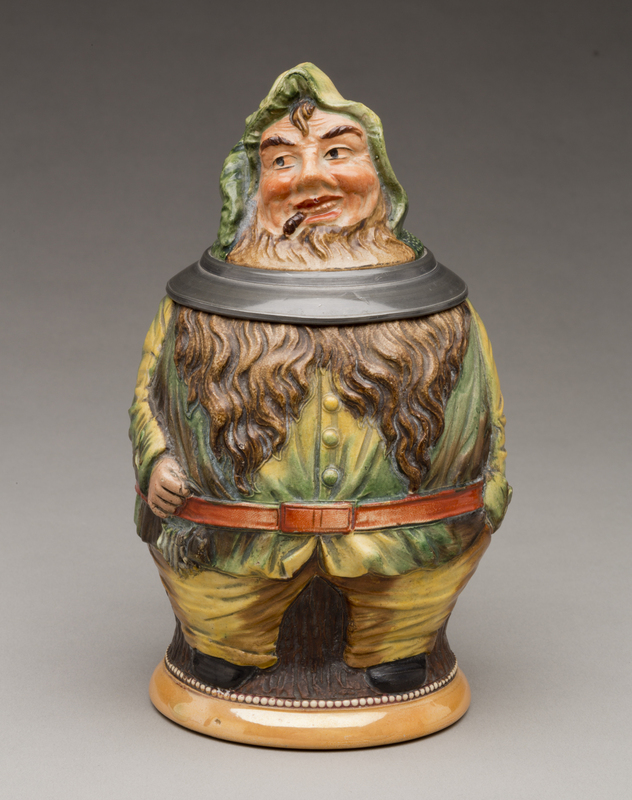 This entry was posted in Art, Curatorial and tagged European art, From the Collection, German Art, steins. Bookmark the permalink.